Big fan of science, huge advocate of public engagement. Working at the interface of chemistry and chemical engineering. Winner of the Vice-Chancellor's Award for Public Engagement with Research. This presentation is about my research on activated carbons, and how they can used to remove tricky water toxins. They’re not yellow or edible, but much like Leerdammer, nanoporous materials are full of holes. These holes are what give these materials their world-saving potential. From hydrogen storage to water filtration, join Jemma Rowlandson as she delves into the world of tiny holes with big applications. She’ll explore how these surprisingly ancient materials work, where we can use them, and outline two of the biggest research areas in nanoporous materials: choosing the size of the holes, and actually trying to see them in the first place - neither of which are as easy as they might seem. An 80,000 word thesis in three minutes. This was the goal when I presented my thesis topic 'Sustainable Activated Carbons from Renewable Feedstocks for Water Treatment Applications' at the 3MT faculty competition at the University of Bath. I went on to win the University final. What does Leerdammer cheese have that no other cheese does? It's full of holes! 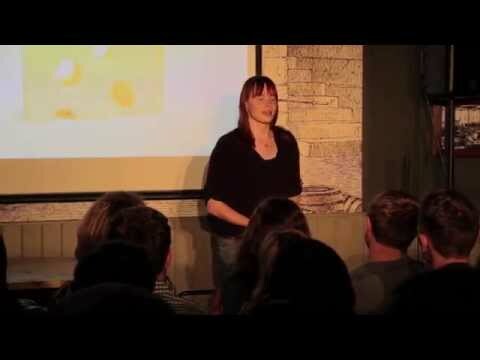 This talk given at Science Stand Up in Bath explored how holey, porous materials (aka the Leerdammer cheese of the chemical world) can be used to save the world, by using them in water filtration, carbon dioxide capture and energy storage. The principle of how these materials work, by adsorption is also presented in a fun and engaging way, aided by lots of Velcro and a woolly jumper. Hydrogen has enourmous potential as a clean, green fuel. It can be made from water, used to power a car, and the only by-product is water! One big problem though is hydrogen is a gas and notoriously difficult to store. This presentation introduced using porous materials with nanoscale holes to store hydrogen, where we are now, and where to go next.This talk was aimed at a general scientific audience, and was the winning presentation of the Swindon heat of the IET Present Around the World Competition. Science communication is very important, and I always jump at the chance to participate. I have extensive presentation experience, from science stand-up comedy to specialist research presentations. My research focuses on targeting difficult to remove water toxins using activated carbons. I was awarded the 2016 Vice Chancellor's Prize for Public Engagement with Research from the University of Bath.